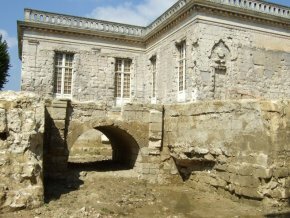 20/9/10 – Heritage – Blérancourt, château – Readers will recall (see notably this article) that some remarkable elements of the château of Blérancourt by Salomon de Brosse had been discovered when work first began for the extension of the Musée de la Coopération Franco-américaine. Several associations had stepped in at the time demanding that construction should stop in order to preserve the vestiges. Alexandre Gady, vice-president of Momus, had confirmed in an interview (see here) that his association had taken the case to court requesting the cancellation of the construction permit issued by the Préfet. The administrative court of Amiens has now supported the association’s claims on all points. The group was therefore entirely justified in taking this initiative, as opposed to the opinion expressed by the Préfet, since the construction permit was riddled with errors which justified its subsequent cancellation. An expert committee had met, strangely enough only once, on 7 November 2007. Madame de La Conté told us that the committee would once again be consulted when presenting the new project. Still, we cannot help but wonder : if we are to understand the DRAC, this procedure no longer applied as the initial project had been abandoned. So, why did the government refuse to withdraw the building permit in the past three years ? This would have avoided the Momus initiative and saved the association from spending funds . Above all, it would have spared the useless outlay of public finances, which are already stretched to the limit, as well as further burdening the court system with a lost cause which, if we are to believe the DRAC, was, notably, long obsolete. We sincerely hope that Victor Lyon’s new project will do better than the previous one in respecting the monument, which was to have been installed smack in the middle of the château’s vestiges, thus deforming it totally. We do not see why the extension cannot be erected at the back of the building, where it will not eclipse it, even if this means connecting it to the existing one through an underground passage. This would finally resolve the problem of the archaeological ruins as well as protecting the heritage of the original building. The government has been sentenced to pay the association 1.000 € which does not cover its costs.